"One Man's Hero" tells the little-known story of the "St. Patrick's Battalion" or "San Patricios," a group of mostly Irish, and other immigrants of the Catholic religion, who deserted to Mexico after encountering religious and ethnic prejudice in the U.S. Army during the Mexican-American War. The plot centers around the personal story of John Riley, an Irishman who had been a Sergeant in the American Army, who is commissioned as a Captain in the Mexican Army, and commands the battalion, as he leads his men in battle, and struggles with authorities on both sides of the border. I just got back from seeing this great, great movie. Great story, great acting. 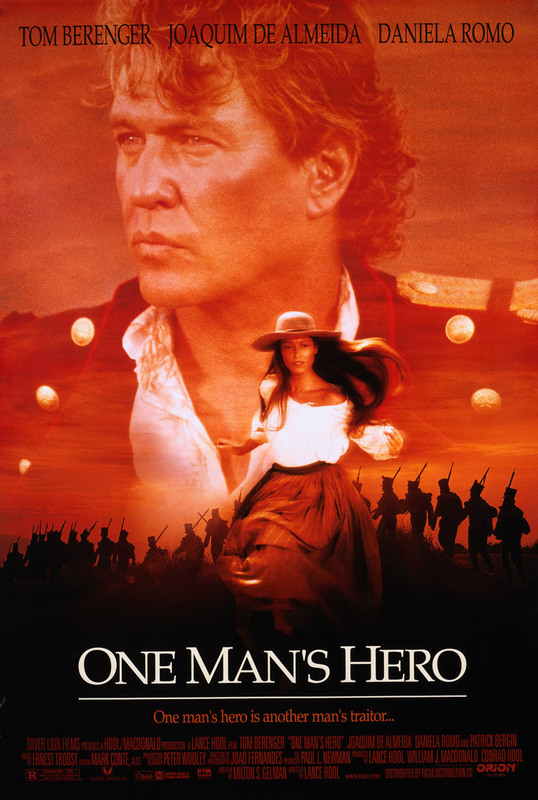 Tom Berenger is kind of an anti-hero like Clint Eastwood in UNFORGIVEN in this awesome, epic film about the disillusionment that Irish immigrants turned US Soldiers find during the Mexican American War. The guy from Clear and Present Danger, Joaquim or something, is superb! Daniela Romo also does a surprisingly great job, not to mention all of the Irish guys I've never heard of. Definitely a classic film. If there is one movie you see this year, make it this one. It will blow you away! I learned about the San Patricio Battalion in college and even did a senior paper on the unit. Consequentially, when I heard about their story coming to the big screen I looked forward to it. The story, though interesting, is not without its flaws. Set at the eve of the US-Mexican War (sometime in late April 1846 given that war hasn't broken out yet), the movie spans the duration of the war and initially attempts to give a nod to our country's unhappy heritage of ethnic bigotry against, in this case, the Irish and other then-recent European immigrants. This bigotry drives a few of these immigrants from the US Army into the service of Mexico, in time for the war between both countries. In the movie Tom Berringer's character of John Riley is the leader of a small group of these deserters although, historically, John Riley was already in the command structure of Mexico's San Patricios some good time prior to the battle of Monterrey which is shown in the film. The unfortunate fact of the war for Mexico, other than it lost half its territory at war's end, was that her generals were incapable of winning a battle against the Americans. The movie certainly illustrates that point but, surprisingly the major Battle of Buena Vista is given only the slightest nod. I say "surprisingly" because during the course of the battle one single Mexican artillery unit created so much havoc on the American lines: the San Patricios! So many experienced artillerymen had joined the unit that its skill was considerable; formidable enough to warrant Zachary Taylor to single out the San Patricio Battalion's position on the battlefield and explicitly order his cavalry to "Take those Damn Guns!!" (which they never did). The movie's weakest point, I believe, is sacrificing the story of the unit and its men for the sake of telling a love story between Berringer's Riley character and the Marta character. More sympathy for the Patricio characters could've been generated by concentrating on the relationships between the small unit's men ala "Saving Private Ryan", than diverting the story into Riley's quest to find Marta prior to the final battle of Churubusco. Modern Americans' response to the notion of the San Patricios is that they were unjustified traitors who deserved hanging. The movie also could've better spent more of its time justifying the Patricio's cause rather than alluding to it being merely the result of the prohibition of attending Catholic Mass. Lastly, the overdubbed voice at the end of the movie seemed so ham-handed that the epilogue it provides could've been better served by an on screen written epilogue. Overall, the film is an OK though historically inaccurate retelling of the San Patricios' story. Granted historical film viewing should not be looked at as the equal of reading a history book, but the unfortunate fact is that many film goers tend to see both as equals. To be sure the battle of Monterrey is my pick for "highlight of the film". But if one wishes to be better acquainted with the San Patricios, one is better off reading a good book. Basically a TNT Western with Tom Berenger in the lead.